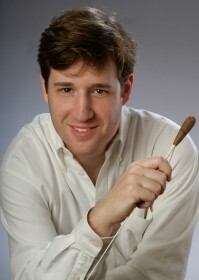 American conductor Israel Getzov is currently Music Director of the Conway Symphony Orchestra. He also serves as Music Director of the Little Rock Wind Symphony, and previously held the position of Associate Conductor of the Arkansas Symphony and Principal Conductor of the Tianjin Philharmonic, the resident orchestra of the Tianjin Grand Theater. Mr. Getzov has conducted orchestras throughout the United States and abroad including Abilene Philharmonic, Shanghai Philharmonic, Asheville Symphony, Symphony of the Mountains, Skokie Valley Symphony, Monroe Symphony, Cleveland Pops, Tianjin Symphony, Zhejiang Symphony Orchestra, and the Encuentro Jovenes Musicos Festival in La Paz, Bolivia. As an opera conductor, he led the world premiere of The Scarlett Letter by American composer Lori Laitman, conducted works of Giancarlo Menotti at the Shanghai Oriental Arts Center and the Cleveland Institute of Music, and worked as Staff Conductor for Tianjin Grand Opera in productions of La Traviata, Il Trovatore, Rigoletto, Bluebeard’s Castle, and Oedipus Rex. Mr. Getzov was selected by Leonard Slatkin to conduct the National Symphony Orchestra at the Kennedy Center in Washington, D.C. and was chosen by David Zinman for the American Academy of Conducting at the Aspen Music Festival. Mr. Getzov started the violin at age 3, and later studied viola, piano and percussion. He has performed as an orchestral violinist with many renowned conductors including Barenboim, Boulez, Solti, Mehta, Jansons, and Rostropovich. He was a founding member of the Rockefeller String Quartet, a professional quartet with whom he gave over 200 concerts. An in-demand educator of ensemble techniques, Mr. Getzov holds a tenured professorship at the University of Central Arkansas, and has given clinics at many schools in the U.S. and internationally. An experienced speaker, he was the host of his own weekly radio program on Arkansas KLRE 90.5FM called “Izzy Investigates” and he has also performed live as a chamber musician on WFMT and WBEZ in Chicago. He has performed many times on television both in U.S. and in China, including CCTV.